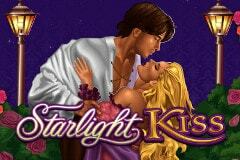 Players who like to see handsome men with their shirts ripped open and seductive blondes smooching with them under the stars, will want to try out the Starlight Kiss pokie from Microgaming that’s presented as a cheesy romance story in the style of a Barbara Cartland novel. Definitely one that will attract some people and others will steer well clear of, but with a couple of loveable bonus features, like free spins with multipliers and a pick-a-prize type game, even the most hard hearted of players should appreciate the content, if not the style, of this game. The love affair takes place in the rose garden of a manor house, with some of the higher value symbols reflecting this theme, although smaller wins come from landing the usual playing card icons 10, J, Q, K and A. At least they have been designed in a swirly fashion and have little pictures of roses next to them, so the theme runs across all symbols. The game itself is very well designed with a background image of the garden behind the reels, which in turn are surrounded by a decorative gold frame complete with a couple of clocks on top for some reason. The payline indicators that run up both sides of the reels fit into the picture as supports for romantic lights and even the control buttons are decorated to fit into the theme. Players use these buttons to activate anything from just 1 to all 30 lines, adjust coin values from 0.01 to 0.50 and play with between 1 and 20 coins per line. This makes the potential bet range from 0.01 to 300.00 per spin. 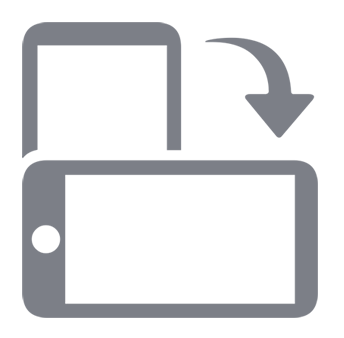 Wins occur by landing 3 or more matching symbols across an active line running from the left side and as a nice little touch, animations play out whenever the picture symbols are part of a winning combination. Those pictures include a pink box of chocolates, an old feather pen and love letter, the beautiful blonde and the romantic guy offering her a rose. The lovers will still reward a mixed pay prize if the 2 different symbols land on a line, which is a nice touch that can bring in an extra win or two. The Starlight Kiss logo is a wild symbol, so it can replace any other, except for the scatter, if doing so completes a winning combination and it’s also worth a big payout when making up a line on its own. The scatter symbol is the mansion house and this also has a couple of bonuses attached to it. As the name suggests, it can be scattered around the reels to be worth a win, while the amount paid will be multiplied by the total bet, not just the line bet. Any 3 or more scatters will pay the win and then trigger a free spin bonus game, with 14 spins playing out and all wins during them being doubled in value. The reels are standard in this round, so there’s no certainty of a winning spin, but landing 3 more scatters will re-trigger them with another 14 added to the end of any still left in the current round. If the Bonus symbol stops on the middle 3 reels at the same time, players enter a fun game that plays out in a garden setting where they see a pond, swans, statues, a rose trellis and several other objects scattered around the place. The aim is to pick 3 of the objects in the garden and either collect cash prizes hidden within them, or hearts that go towards a multiplier meter. Once the selections have been made, the cash is awarded and multiplied by however many hearts were found. It’s a short game, but can be quite lucrative. Is It All Hearts And Flowers? Starlight Kiss may divide opinion when it comes to the theme and overall looks of the game, but there’s no escaping the fact that it’s got a couple of nice bonus rounds and has been well-designed. The quality of the picture symbols, the background images and the animated sequences all combine to make this one of the better-looking games from this developer, but of course it’s the payouts that are most important, and this one has some decent wins in both the base game and bonus rounds.